Grantham 2nds 245-8, Woodhall 2nds 234-9 - Grantham won by 11 runs. 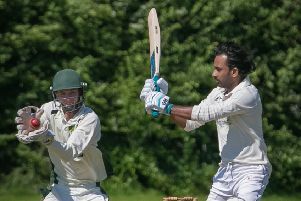 Woodhall Spa CC Seconds began their South Lincs and Border League Premier Division campaign with defeat at Grantham Seconds. Daniel Freeman’s 111 and 76 from Jaden Fell helped the hosts to 245-8, with James White (4-46) and Matt Haslam (2-40) among the wicket takers. In response, Woodhall finished their overs 11 runs short. New Zealander Brandan Laurenzi struck 75, aided by Thomas Dixon (39), Danny Wells (37), Tom Caswell (14) and Will Sharpe (13). Woodhall Sunday 1sts 238-5, Bracebridge Heath Sunday 1sts 159 - Woodhall won by 79 runs. Openers Brandan Laurenzi and Oliver Caswell struck half centuries as Woodhall Spa Sunday Firsts beat Bracebridge Heath at Jubilee Park. Both recorded 56 while support came from Sam Cooke (36 not out), Jack Hughes (24), Adam Barker (23 not out) and Ross Dixon (14). The visitors were dismissed for 159 with wickets taken by Ross Dixon (3-26), Kieran Richardson (3-29), Tom Caswell (2-20), Henry Wilson (2-9).